Just wanted to do a quick post to wish you and yours a Very Merry Christmas! Like many of us, things have been pretty busy around The Valley Line. Not much progress to report, but I've been getting to stuff as I can - mostly structure part prep for Ballantine's and Wethersfield Lumber. I hope to have progress photos - and maybe even some tips - posted soon. And I'm really looking forward to ramping up progress after the holidays (including a brief planned diversion to build a couple of F&C New Haven RR gondolas that I received from Santa TomD!) despite the up-coming legislative session. I hope your "Santa" brings you lots of fun RR stuff - but I wish most for you that you get the gift of some time to enjoy what you have: build some kits, work on your layout, or even enjoy some "armchair modeling" by the fire (or a video of one playing on your TV/ipad). It's a wonderful time of year, made all the more wonderful by this amazing hobby and the people you meet along the way. 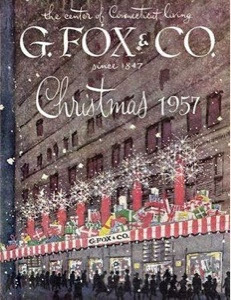 G. Fox & Co. - Where CT Valley folks did some of their Christmas shopping back in the day (or at least visited for the amazing displays). Not 1947, but close enough to provide some fun holiday time-travel! After switching out some wheels, I decided to change things up a bit and paint the "concrete" sills on the Ballantine building. Small brush, strained Floquil Foundation paint (still lumpy, go figure) and a steady hand. Surprisingly therapeutic - and perfect for a spare hour on a Sunday afternoon. Just a quick grab shot of the only layout I ever completed (so far). 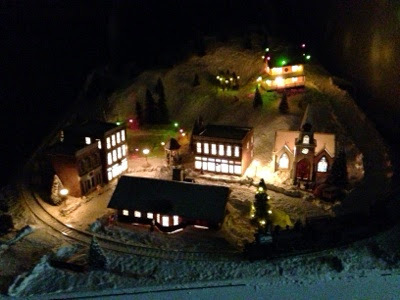 A loop of track, assorted buildings (all lit), and a bunch of mini-scenes including skaters on a pond, a Christmas tree salesman, a snowball fight, etc. There's even a town tree and Santa in the gazebo. It's fun to spruce it up each year - and is a great way to get into the spirit of the season. Here's a question for you . 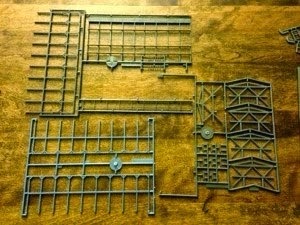 . .
Pictured are the "wood" parts representing interior bracing & racks for the Walthers Walton & Sons Lumber Co. kit. 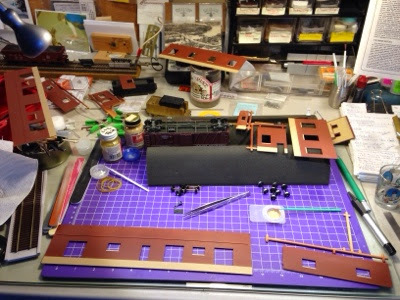 I'll be using this kit to represent the Wethersfield Lumber Co. on my layout. ...so, as you can see, most of that detail will be hidden). The question is: How would you paint/finish all that interior detail? I know not to just build it "as-is", relying on the molded plastic color. So what's a quick and easy approach you'd recommend? While I'm at it, here's another question.... How would you do the exterior walls and roof? I was thinking just shooting Grimy Black on the roof parts and weathering them. As for the walls, I'm considering trying a "peeling paint" technique - where I spray it with some sort of "weathered wood" base color (or perhaps - yikes! - do the weathered wood technique from those websites!) and then brush on some rubber cement before shooting a top coat. Erase the paint from the rubber and - voila! - peeling paint. What do you think? Any other tips/approaches you'd suggest? Valley Local southbound, slowing to observe the 10 mph speed restriction on the curve north of Rocky Hill, according to the Bulletin Order. Looking south into Rocky Hill, we see the Air Line crew in the distance, arriving in Middletown. Valley Local in Cromwell switching the elevated coal trestle of Lee & Son's Coal Co. The main reason for the session was to finally get Jim over to run the layout. He hadn't seen it in a while, so there was a lot that was "new" to him. I also wanted/needed a good excuse to address some of the issues that had cropped up during the last session: some feeder wires came unattached, and the 278's pilot coupler had started to fail (I fixed that here). Thankfully, the replacement coupler worked just fine - and the engineer on the Air Line Local (i.e. BillS) let me know there's a "scale" sized option. 1) I'm not as impressed with my "innovative" uncoupling tools as I thought I'd be. I asked a couple of the other operators and the consensus was that "they work like a champ on #58s, when coupled to other #58s - less good on others, or mixed types." So, more experimentation needed. For next session, I'll provide some skinny bamboo skewers (thick skewers - and the damage they tend to cause - are what pushed me to develop an alternative in the first place). 3) Related to the 278 shorting, I noticed that I'm still having trouble with shorting when exiting (and sometimes entering) the reversing section. The polarity in that section is controlled by 2 bays on a Frog Juicer. Unfortunately, the problem is intermittent and can't be consistently replicated. I thought at first that the section may have been too, um, short (as in too short for the length of trains I run over it) and the Juicer was trying to switch polarity under the engine at the same time as it was trying to switch polarity under another car toward the end of the train. But that would require wheels (all my wheels are metal) to be bridging the two sets of rail gaps at precisely the same time. Even when I did that myself manually, I couldn't get things to short out. So, more investigation needed. Let me know if you have any ideas - electrical gremlins can be notoriously difficult to fix. 4) Actually, this doesn't really rise to the level of a "fail" - it's more the cost of doing business operations: I had a coupler fall off one car during the session, and discovered another car (on semi-permanent loan from a buddy) had plastic instead of metal wheels. So those cars are on the workbench for repair/upgrade. 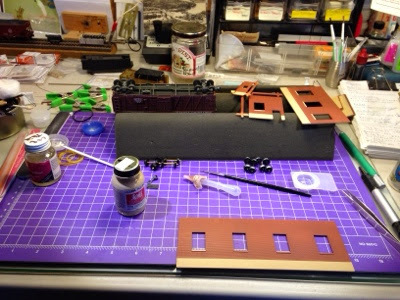 I've said it before - and so have others: Ops Sessions are the ideal catalyst for keeping on top of your layout maintenance, as well as highlighting what else needs to be Done Right Away and what upgrades make the most sense to do sooner rather than later. I can't recommend them enough. Thanks again to those commenting on Part 1 of this series. I took your comments to heart - and promptly chickened out. I'm going to wait a bit before attempt to drill such a small hole in the (very) narrow shank of a KD #58 metal coupler, drill press or no drill press. To my credit - or at least an argument against my "chicken-ness" - I found an alternative solution. McHenry makes a plastic coupler that has a much-more-reliable closing mechanism: metal spring rather than a sliver of plastic. There's even a little letter "E" pressed into the underside of the shank that you can use to start your hole (with the point of a safety pin, in my case) and then it's a snap (not literally, thankfully) to drill out the hole with a #72 bit. The couplers are oversized - but BillS told me at my last operating session on Friday (report coming soon) that they make a "scale" size coupler. So this won't be a problem for long. The resulting shims (one pictured above) are so small, I couldn't even get my camera to focus properly for a picture (note to self: get a macro lens app). But I used some copper wire to thread a shim, then the coupler, then another shim into a "sandwich" (shank between two shim "slices") and then used just the tiniest amount of styrene glue you can imagine to stick things together just long enough to keep the 3 holes lined up for positioning in the pilot draft gear box and sliding the fixing pin down from the top and through the holes. I'm very happy with how this turned out, and the coupler performed like a champ at the ops session. Pilot couplers on brass steamers are usually just dummies, but if your engine is in anything but dedicated passenger service, it's likely it's going to have to switch a car or two at some point using the pilot. 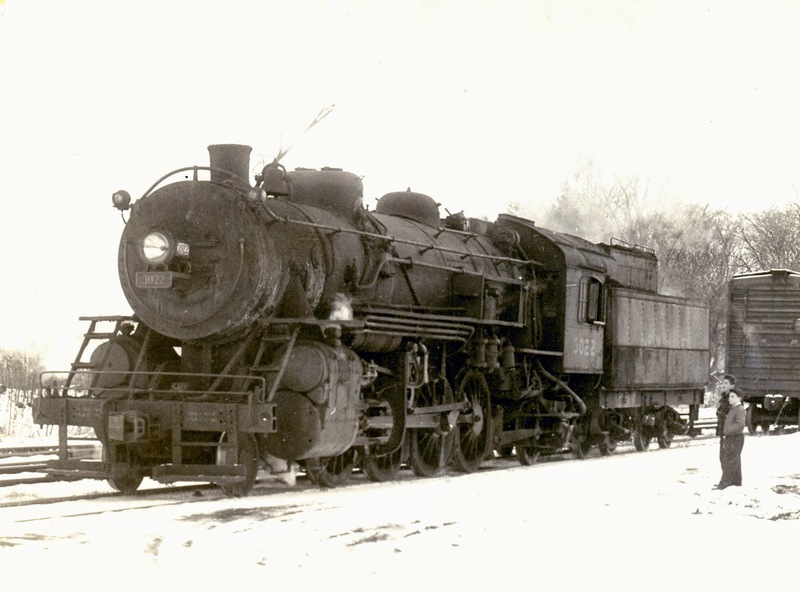 On a local freight engine like my K-1 mogul, a working front coupler is an absolute must. And now I have a pretty easy way of modifying couplers to fit what the brass manufacturer left me with. Hope you find this method helpful too.